Digital signage has been used as a prominent form of communication for more than a decade. You’ll find it in just about every venue. Yet, many people still do not have a correct understanding of what it is or how it is different from television. 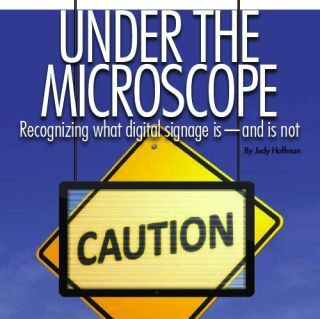 The term “digital signage” has been used for years, so why all the misunderstanding? Try explaining what digital signage is and how it works to someone who knows nothing about the technology. Soon you’ll see, first hand, where the culprit lies. For the general public, digital signage is literally indistinguishable from TV. Often, some will say, “Well, yes, I’ve seen televisions in stores or restaurants.” More business-minded folk will say, “Oh yes, the screen with PowerPoint presentations.” Both are erroneous; digital signage is none of the above. Let’s dig deep into the basics. Wikipedia defines digital signage as a form of electronic display that shows television programming, menus, information, advertising and other messages. Unfortunately, this is an ambiguous answer and doesn’t accurately define this growing technology. Wikipedia identifies digital signage as an electronic display, implying that this is what makes it digital—when its digital nature is actually a combination of hardware, software and screens. Second, it incorrectly throws in the word “television programming” as part of its many uses. And here is the problem. This misconception is fed by the fact that many digital signage users quickly assume that since TVs (including LCDs and LEDs) are being used to display content, viewers will expect television-like advertising. The end result is chaotic, motion-packed screens that entertain viewers with flashy graphics, at the detriment of delivering the message. Let’s take a closer look at digital signage by focusing first on the word “signage.” With “sign” as the root word, Wikipedia tells us that a sign is “any kind of visual graphics created to display information to a particular audience.” Another definition of this keyword is “a display structure bearing lettering or symbols, used to identify or advertise.” Simple enough. A sign conveys a message, but these definitions do not mention anything about entertainment. Now let’s adjust our lens to focus on the word “digital.” Digital is defined as “relating to or being a device that can generate, record, process, receive, transmit or display information that is represented in discrete numerical form or relating to or being a service that provides information expressed in discrete numerical form.” Again, there is no mention of entertainment in this definition. Digital signage is simply a sign, but rather then being printed with ink on paper or vinyl, the message is digitally displayed on a video screen. But just because this information is displayed on video or television screens, it does not mean that such displays need copious amounts of motion. There are situations in which viewers need to be entertained by programming, such as at a sports bar. That is television. Television programming is something quite different from digital signage. The majority of digital signage deployments fare better with little or no video content or motion. After all, think of how most signage is used: to provide vital information, such as wayfinding, menus, schedules and identification. People are usually on the move when they encounter digital signage, and chances are, they won’t stop. For typical signage applications, simple and subtle content with smooth transitions is the only movement necessary for updating, changing and adding new information. Imagine trying to find a particular menu item on a digital menu board when food items are flying across the screen. Digital menu offerings should be displayed as traditional static menu boards. The same goes for signs that identify meeting rooms; these only need to display the room number, the name of the meeting and the speaker’s name. There is no need to confuse the viewer’s eye with motion. Using motion in these applications complicates the message and deters focus and concentration. Moving images may catch viewers’ attention, but it becomes difficult to find pertinent information when the information is moving. More users are coming to the realization that in most cases limited use of motion is ideal and much more effective. Just because the technology allows you to create content that crawls, flashes, flies, rotates and seemingly bursts off the screen, doesn’t mean you should. We are in the era of digital signage, and there is no going back. We will be seeing more digital screens functioning as signs. Already, they are becoming somewhat commonplace. While there will always be a need for traditional signs, we’ll see less of them in certain applications. But, we will see digital signage supersede traditional signs because digital signage is a bright and visually stunning solution. The industry is moving away from backlit signs that require bulb replacements and expensive printing and delivery. Linked to databases, digital signs bring ease to promotional launches, which can be tested and deployed easily over digital signage networks with instantaneous changes. To sum it up, magnifying the smallest parts of digital signage and dissecting its uses sheds light on its basic definition. It is not TV or television advertising. It simply possesses the basic components of traditional signage, yet offers the ease of digital creation and control.